Take the Pantene 14 Day Challenge and end hairfall! Are you a beauty, fashion or make up blogger? 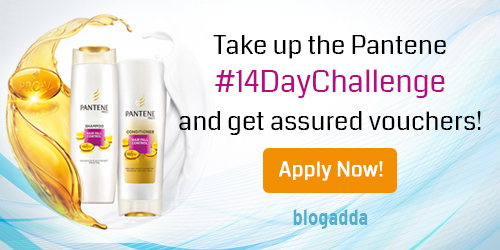 BlogAdda and Pantene invite you to review the new best ever Pantene shampoo, which promises to help you win the battle against hairfall in just 14 days. This new best ever range with its better than before Pro-V formula and advanced conditioning properties helps prevent hair breakage caused by damage, giving thicker, stronger hair and resulting in up to 98% less hair fall when used daily. We want you to take this new offering from Pantene for a test run, and tell us the results with a review post! We know that your readers look at you for inspiration and advice when it comes to haircare. So why not give them a solution that will take away their hair problems through your review? Speaking of reviews, the Pantene #14DayChallenge will give you the opportunity to write a fun, exciting and innovative review, details of which we’ll give you once you’re shortlisted. Excited? Click on the button below to apply! With the festive season coming up, it is *mandatory* for everyone to look and feel their best. And once you have won over the hairfall monster with Pantene, looking good will come easily to you! Let the #14DayChallenge begin! Hi Team BlogAdda, I’ve been trying to register but the form is not accepting my Facebook profile or page id, though it’s perfectly valid and working. Registered on the link. Hope to get shortlisted too.. I am not able to register for this it gives error regarding my facebook url though i am entering valid url. Same issues here since yesterday, it doesn’t accept my Facebook id! I just entered the URL of facebook (https://www.facebook.com) as it doesn’t accept the profile ID.